I am a huge fan of Abraham Lincoln books and read all I can about our 16th President. 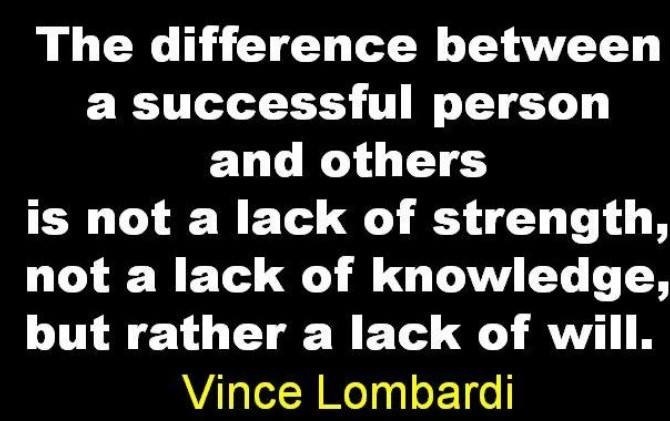 His stories of ‘never quitting’ are some that Vince Lombardi sure must have liked. In reading material and books on Lincoln I remember reading about a young man who aspired to study law and wrote to Abraham Lincoln for advice. Lincoln’s reply was really what was expected of him as he replied to the young man, “If you are determined to make a lawyer of yourself then half of your work is done.” That statement refers back to a previous article I had written about the difference between having ‘choices’ and making ‘decisions’. Choices will always be plentiful but ‘decisions’ are what really counts. Lincoln knew a lot about not giving up as he was the most persistent individual I’ve ever read about. His story of turning defeat into success goes like this. 1848—he was defeated for Congress, again. Lincoln had said he had walked to borrow every book within fifty miles of his home to continue to educate himself. Log fires would burn all night long so he could read by the light of that fire. Once he fell asleep on his bed of leaves, he would wake up early morning rubbing his eyes looking for his books and devouring them one at a time. Public speaking has always been a fear of Lincoln’s. To conquer this fear he would walk 20 to 30 miles to hear a speaker and walk home and practice his talks he had heard in the fields, woods, or the local country store in his hometown. He joined literary and debating organizations and practiced speaking much the same way we do today. Regardless, he would find a way to conquer his fears and was persistent in overcoming his obstacles. Lincoln had a terrible sense of inferiority in the presence of women. When he dated Mary Todd he would sit in a parlor, very silent and bashful, unable to find words to deliver to the woman he was so interested in. He would sit and listen while Mary Todd did all the talking. This is the same person who debated the highly successful speaker, Senator Stephen A. Douglas and the famous talk at Gettysburg and again in his second inaugural address rose to heights of unmatched eloquence that have led many others to this day to follow his lead as their mentor. Why not try Roosevelt’s plan? If you are feeling discouraged and feeling like giving up the fight to overcome obstacles in your life, follow Roosevelt’s plan to find ‘solutions’ to the ‘problems’ vs ‘dwelling’ on the problem. His obvious ‘mentor’ in life was Abraham Lincoln. Roosevelt would often read anything written about Lincoln and would become inspired by Lincoln’s incredibly strong positive attitude. In losing in two attempts to become a U.S. Senator, Lincoln continued moving forward and became President of the United States. The lessons learned here are simple ones that can dramatically change your life. I know it has changed mine. So many times I looked at my situation growing up as a young man in Opelousas, Louisiana with illiterate grandparents who could only speak French. Their only income was state assistance to the tune of $300 a month. We didn’t own an automobile or have the common necessities like air conditioning, hot water, or even television that everyone enjoys today. Many of the people in the community saw me as a ‘poor young lad’ that would lead a hard life. Not much encouragement came, as the only way out of the poverty I was in was to go to school and get a ‘good job’. I wasn’t a good student or a good high school athlete, so I didn’t receive much encouragement from anyone in school. I had very good teachers but none who saw anything special in me. Luckily, my first mentors, Maw Maw and Paw Paw Daigle were optimists and believed I could be successful or do anything I wanted to do. I believed them before I believed the people who saw me as a ‘victim of poverty’ . My grandparents saw me as someone with the intestinal fortitude to ‘want’ to become an entrepreneur. I believed and never undertook anything thinking defeat but instead as a bungling novice started several businesses. My first was a little store in my grandmother’s shotgun home selling used toys at the age of 13. Then came several attempts that failed at business but along the way gave me great skills. Maw Maw would call that ‘the school of hard knocks’. Boxing promotions came into my blood and before I knew it I was involved in a professional level signing fighters as their agent and promoting shows on national television. Why do I tell you this? I am not out to impress anyone but hopefully to ‘impress upon you’ that anything is possible if you follow Lincoln’s philosophies of ‘never quitting’. In Lincoln’s lessons of life I learned you need to believe you will succeed. Believe it firmly and you will then do what is necessary to bring success about. It’s called ‘THE WILL TO WIN’. I know you will hear that winning isn’t everything. I don’t agree. If winning isn’t everything, why do people keep score? Winners become champions. Champions NEVER lose....they either WIN or they LEARN. Want more info on believing in the impossible? Believing in winning ...in dreams...and miracles? Visit dreamsfairytales.com for the book DREAMS, FAIRY TALES, and MIRACLES and join facebook.com/dreamsfairytalesmiracles and join a select group of those wanting to receive positive affirmations weekly.